12. Marvin K. Mooney - What Else? Available via mailorder for $10. 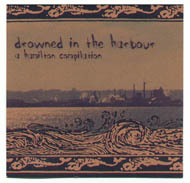 "It's been a while since somone was inspired enough to put together a compilation of Hamilton artists. 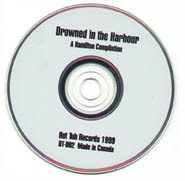 That's too bad, because compilations like Drowned in the Harbour are not only a great way to sample several of Hamilton's musical delights in one sitting, but also offer the listener a time capsule, documenting a specific period in the scene's evolution. Drowned collects 16 tracks from eleven bands including Sara Somebody, The Probes, Marvin K. Mooney, Big Brother and Holy Joe and it runs the gamut from the '60s-inspired garage groove of Evil Engine's "3 Miles" to the folk of Zildo Ildo's "Unnecessarily Sad" to the more direct pop rock of Hereafter's "Scream". If one were to complain, it could be said that the album paints a somewhat incomplete picture of Hamilton's music scene, but since it is only the debut release from the fledgling Hot Tub Records label, it certainly provides us with a great taste of things to come. The Harbour refers to the Hamilton-Burlington backwash and, like any regional sampler, it's a mixed bag. There's a a streak of absurdity running through it, which renders a lot of the work either endearing or disposable. Caledonia's Big Brother(who debuted last year with the 100-track, double-CD The Blank Years) push that dichotomy to the brink by mixing punque-rock, brainy improv bits and fifth-grade fart jokes. You could say the same thing about the general wheezy vocals, but some compensation is made via some nimple instrumentation, eg. Zildo Ildo's wonderful saw solo and The Probes' wise decision to shut up and surf. The Real corkers, though, are the two Hereafter tracks, which percolate pop and rock flava in a high speed blender with helium-sweetened vocals.